Mile Square Health Center main location at 1220 S. Wood St.
Cancer patients and their families living on Chicago’s West and South Sides now have access to free supportive therapy and survivorship programs close to home, thanks to a collaboration between Wellness House and the University of Illinois Cancer Center, part of the University of Illinois Hospital and Health Sciences System, or UI Health. The programs, which are led by Wellness House staff and offered for the first time at a federally qualified clinic in Chicago, include exercise and nutrition classes, stress management sessions, and support group and counseling opportunities. “Cancer survivorship begins at the time of diagnosis and these programs are meant to be a place where patients and their families can learn and gather information and participate in activities that are beneficial to their emotional and physical health,” said Dr. Susan Hong, director of the cancer survivorship program at the UI Cancer Center. Previously, Wellness House services were primarily provided to cancer patients and their families at its Home of Hope in suburban Hinsdale, Illinois. For the last two years, the nonprofit has been expanding services to partner locations. 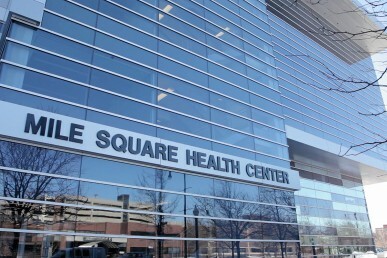 Its latest partnership will feature more than 40 programs offered at two UI Health locations each month – the Cancer Care Outpatient Care Center (1801 W. Taylor St.) and Mile Square Health Center (1220 S. Wood St.), a federally qualified health center, or FQHC – making it easier for historically marginalized communities near UI Health to access these services. “We are excited to work with the UI Cancer Center to bring our evidence-based programs directly to communities that may have otherwise struggled to access the type of psychosocial and supportive programs we offer,” said Lisa Kolavennu, senior director of programs at Wellness House. Example programs include Exercise for Staying Well, Cooking for Wellness, Tai Chi Fundamentals, Expressive Arts and networking groups for men, women and young adults. “Incorporating the supportive services of the Wellness House into our survivorship program is a win for our patients and communities,” said Hong, who is also a visiting associate professor of internal medicine at the University of Illinois at Chicago. Hong works to counsel patients — those in active treatment and those who are in remission — on the many physical and mental health issues affected by a cancer diagnosis in the UI Cancer Center’s survivorship clinic, which is the first in the U.S. to be embedded within an FQHC. While this makes the center’s survivorship clinic unique, Dr. Robert Winn, who oversees both the UI Cancer Center and UI Health’s network of FQHCs, believes the program should stand as an example to other centers in the U.S. The UI Cancer Center will also be collecting data on the programs offered in collaboration with Wellness House and will use the information for future research regarding the impact of these programs on cancer outcomes. In addition to offering Wellness House programs to UI Health patients, the survivorship clinic also welcomes people receiving care from nearby hospitals and clinics. Patients and their families who are interested in participating in the programs, some of which are walk-in and some of which require advanced registration, can find information available online.